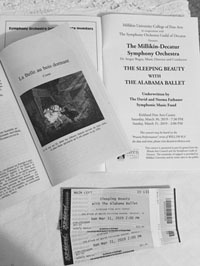 On March 31, 2019 my daughter Annalise and I had the opportunity to see Tchaikovsky’s ballet Sleeping Beauty performed live by the Millikin-Decatur Symphony Orchestra in collaboration with the Alabama Ballet. They did a phenomenal job, and I especially enjoyed hearing a friend of mine play the beautiful violin solos as the concertmaster of the pit orchestra. This was also a special event for us because it was my daughter’s first time to see a ballet performed live, and she is obsessed with Disney’s 1959 film Sleeping Beauty. Tchaikovsky’s ballet and the 1959 Disney film share many similarities, including much of Tchaikovsky’s original music. Maleficent’s ominous leitmotif adequately injects fear into the best of us (and I’m afraid our little ones as well!) Like my daughter now, I grew up watching the film, which was my first introduction to Tchaikovsky’s music. My sisters and I particularly enjoyed dressing up as the three good fairies: Flora, Fauna, and Meriwether. Our favorite character was the blue fairy Meriwether, who plays the sarcastic, mischievous fairy who also casts the counter curse to Maleficent’s evil spell. In Tchaikovsky’s original, the blue fairy gives the gift of mischief, whereas the lilac fairy casts the counter curse and continues as the force of good throughout the rest of the story. In middle school, I had the opportunity to perform part of the ballet in orchestra, which was incredibly challenging as it was my first time to play “serious” orchestral music. It certainly was not an easy debut, but it deepened my love for the tale and the epic music of the composer. This mysterious fairy tale still captures the attention of audiences today, with Disney’s 2014 dark fantasy Maleficent and its upcoming sequel, Maleficent: Mistress of Evil set to release in October, 2019. However, I will always have an affinity for the original Disney classic that first helped me fall in love with the story. TwoSet is Coming to Dallas!! Images and Graphic Design by Celina Gomez, Tim Davis, Rachel Kabukala, and Cassandra Bryan.